After learning about it from Annie Blackburn, and with the help of Deputy Andy Brennan —it’s always Andy— Dale Cooper discovers the Owl Cave Symbol for the first time deep within Ghostwood National Forest, inside Owl Cave. Hence its name. Ever since Episode 25, the owl cave symbol has returned in different shapes and forms. Max Gershman created an animation to illustrate its multiple occurrences in Twin Peaks, Twin Peaks: Fire Walk with Me and Twin Peaks: The Return, hinting at several interpretations, and eventually linking it to the symbol on Mr. C’s playing card. Do you agree all these symbols are related? Hat tip to Curt Clendenin for sharing the GIF. Have you created a fascinating video, written an in-depth article, or decoded the window cleaner’s movements? Please submit your content (or tips) for consideration. I guess, something is missing in the list. not seeing the resemblance of a vintage electrical socket and the ring symbol. Did anyone notice that a sound, when the ring falls in the Red room is normal, not double backwards? The same in the S03E03, also Dougie did not speak backwards as Dale did not. The ring fall is not ‘usual’ lodge event, is tied with leakage of the reality to non-reality, so maybe that’s the reason for Lynch/Frost don’t ring the ring backwards. Also, nobody ever seems to see the inverted ring version as a blue rose, but I’ve been thinking that’s what it looks like for ages. Makes sense too now that we know more about the Blue Rose cases and the ring is being used on tulpas and doppelgangers. Doesn’t make sense at all. You’re comparing a supernatural ring used by Lodge spirits with the code name for an FBI case. Or a hawk, or a chicken, or a crow, or a sparrow. What’s the extra line at the bottom? I’ve never seen that before. What about the “wow bob wow” line? I have a theory also related to a photo of J Edgar Hoover. Notice the white of the right eye in each of the two photos, the arched eyebrows, and the toy horse on J Edgar Hoover’s shelf. 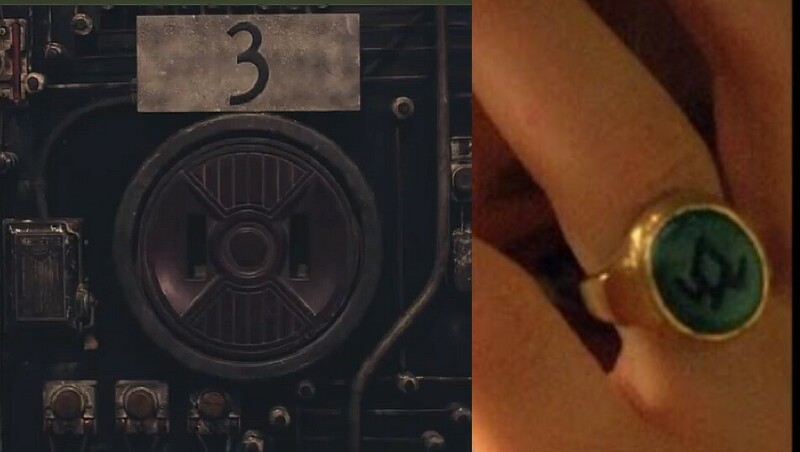 https://imgur.com/a/8B32f — The Ring is the pattern of the tie clip with one of the peaks moved “towards” us the viewer, two of them cut in half to leave room for Lynch, Hoovers doppelganger, and flipped upside down.